Vincent van Gogh Paintings with an unconditional guarantee! 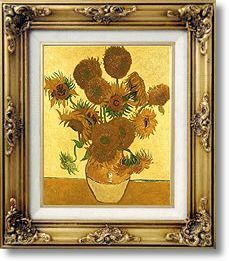 One of four paintings of sunflowers from August and September 1888. Van Gogh wrote to his brother Theo in August 1888, "I am hard at it, painting with the enthusiasm of a Marseillais eating bouillabaisse, which won't surprise you when you know that what I'm at is the painting of some sunflowers..." They were painted to decorate his friend Gauguin's room in the so-called 'Yellow House' that he rented in Arles, in the South of France.